Are you a whiz at writing code but stumped when it comes to writing your resume? You might need a resume reboot. View our sample resume here. To be a successful candidate for tech jobs, resume expert Kim Isaacs says it helps to have a comprehensive resume. Are you a whiz at writing code but stumped when it comes to writing your own resume? You might need a resume reboot. 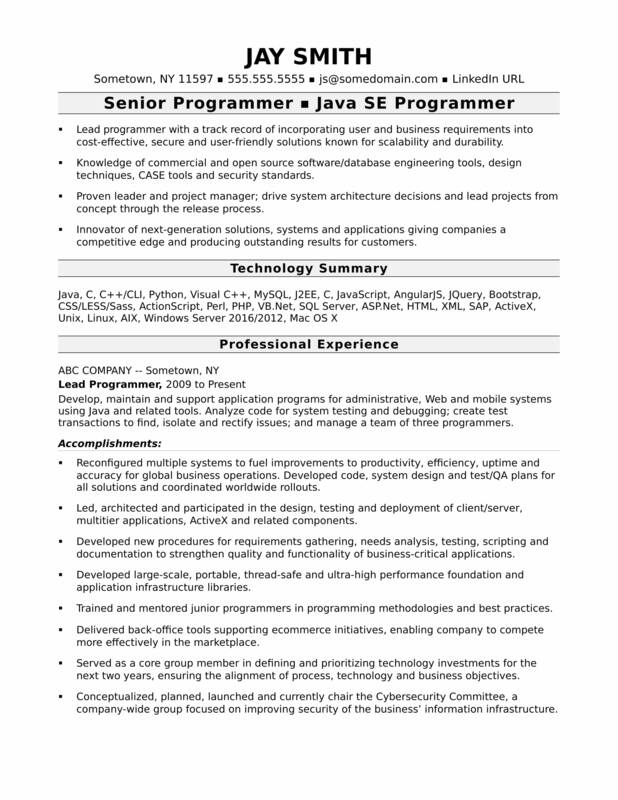 View the sample resume that Isaacs created below, and download the experienced computer programmer resume template in Word. Because computer programming can be done from anywhere in the world, according to the Bureau of Labor Statistics (BLS), your job search parameters are limitless. That said, you'll find the highest level of employment for this job in the following states: California, Texas, New York, Illinois, and New Jersey; and in the following metropolitan areas: New York City, Seattle, Chicago, Dallas, and Los Angeles. As a computer programmer, you can expect to earn a median wage of $82,240 per year, or $39.54 per hour, according to the BLS. Additionally, you can learn more about IT careers and technology careers on Monster. Check out a midlevel computer programmer resume sample and an entry-level computer programmer resume sample for additional resume format tips. Lead programmer with a track record of incorporating user and business requirements into cost-effective, secure and user-friendly solutions known for scalability and durability. Knowledge of commercial and open source software/database engineering tools, design techniques, CASE tools and security standards. Proven leader and project manager; drive system architecture decisions and lead projects from concept through the release process. Innovator of next-generation solutions, systems and applications giving companies a competitive edge and producing outstanding results for customers. Develop, maintain and support application programs for administrative, Web and mobile systems using Java and related tools. Analyze code for system testing and debugging; create test transactions to find, isolate and rectify issues; and manage a team of three programmers. Reengineered multiple systems that fueled improvements to productivity, efficiency, uptime and accuracy for global business operations. Developed code, system design and test/QA plans for all solutions and often coordinated the national or international rollout. Led, architected and participated in the design, testing and deployment of client/server, multitier applications, ActiveX and related components. Developed new procedures for requirements gathering, needs analysis, testing, scripting and documentation to strengthen quality and functionality of business-critical applications. Developed large-scale, portable, thread-safe and ultra-high performance foundation and application infrastructure libraries. Trained and mentored junior programmers in programming methodologies and best practices. Delivered back-office tools supporting ecommerce initiatives, enabling company to compete more effectively in the marketplace through search-engine optimization. Served as a core group member in defining and prioritizing technology investments for the next two years, ensuring the alignment of process, technology and business objectives. Conceptualized, planned, launched and currently chair the Cybersecurity Committee, a company-wide group focused on improving security of the business’ information infrastructure. Led programming tasks including enhancements, maintenance and support for clients’ applications and interfaces. Engineered software products, handling complex analysis and intricate programming to meet project requirements. Led solutions engineering that involved process automation, macro conversion and functionality enhancement. Replaced time-consuming, error-prone manual processes with elegant, automated solutions. Developed and implemented cross-platform, Java-based POS system. Completed project under budget and three weeks ahead of deadline. Coded new solutions that increased availability and scalability by 45% and 75%, respectively. Progressed through promotions, culminating in responsibility for Web-based application programming within high-volume setting. Became adept in analyzing code for system testing and debugging. It's hard to write the perfect resume, making sure it's error-free, up to industry standards, and is packed full of keywords to make it more searchable. Could you use some help fine-tuning the details? Get a free resume evaluation today from the professionals at Monster's Resume Writing Service. You'll get detailed feedback in two business days, including a review of your resume's appearance and content, and a prediction of a recruiter's first impression. It's a quick and easy way Monster's experts can help you spend less time sweating over your resume and more time using it to apply to jobs.